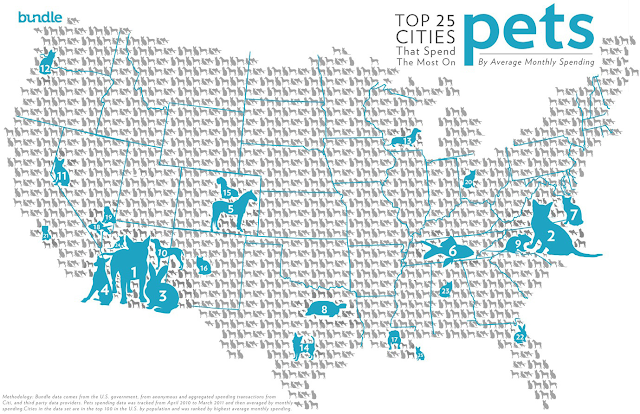 Recently Mike Dang wrote an article for bundle.com on the top pet spending cities in the U.S. by month. How do you, personally, rank? Do you know? We hit the top - and that's even per kitty! PER PET! So in our household, if we lived at Scottsdale, it would mean $47.88 x (7 cats + 1 dog + 1 rabbit + 2 guinea pigs + 1 tortoise) = $574.56 per month. This was a very interesting artical and mom learned al ot just by reading it! Wow, we spend more than that on food alone every month! I think I could be on the top 3, too!!! Very inneresting. I notice none of those cities actually have anything else worth spending on! HAH! Everything in NYC is expensive so they should be on top. 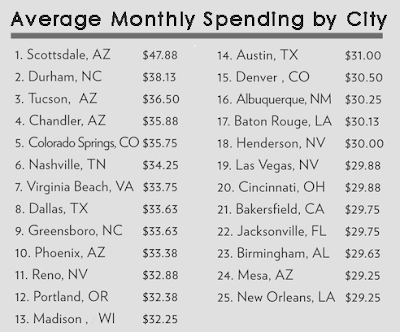 Yep, my human spends AT LEAST as much per cat as humans in Scottsdale. In fact, my human jokes that she throws away that much in food alone that I have shunned. At least, I THINK she is joking! What a fascinating infographic. Mom pondered why certain areas... thanks, it will give her something to think about instead of counting sheep later! Geez... you would think that due to my household alone, that my city would have made the top of the list... and yet we didn't rank at all!! Silly and incorrect infograhic! !